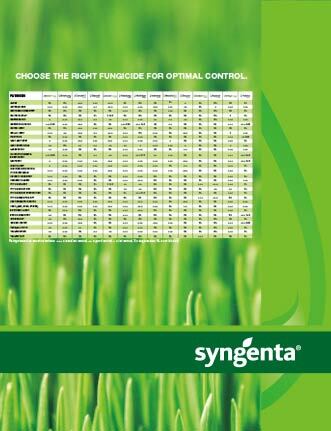 View the Labels/SDS information for Appear Fungicide. Appear® fungicide features two components that work together to improve summer stress tolerance, turf quality and control of both Pythium and anthracnose. The formulation is easy-to-mix and is highly compatible with Daconil®Action™ and Secure® fungicides. Appear provides outstanding turf color and turf safety – all more effectively than the Chipco® Signature® fungicide program. Follow us on Twitter @SyngentaTurf and join the conversation with #Time4Appear. -Jeff Whitmire, CGCS, Superintendent, Williamsburg Golf Club, Williamsburg, Va. Features information about using Appear to control Pythium and anthracnose while enhancing turf quality. Are bermudagrass decline and take-all root rot the same thing? Which Pythium Disease Affects Your Turf? 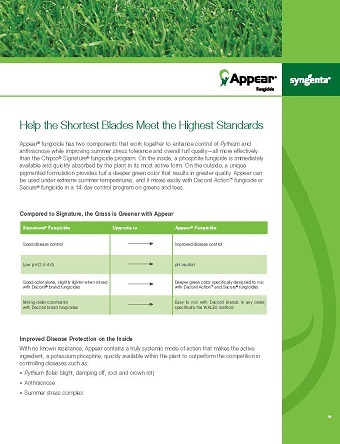 Appear®, Greencast® is a trademark of a Syngenta Group Company. Daconil®, Daconil®Action™, the Alliance Frame, the Purpose Icon and the Syngenta logo are trademarks of a Syngenta Group Company. Chipco® and Signature® are trademarks of Bayer. Secure® is a registered trademark of Ishihara Sangyo Kaisha, LTD.